I am struck by how closely the dimensions of the 7th century Stonyhurst Gospel (now renamed as St. Cuthbert’s Gospel of St. John) match the screen size of the Sony Portable Reader System PRS-505. On the left is a model of the Gospel, which is described in the literature as being 134-138mm high, and 90-95mm wide (1:1.49). The screen of the Sony Reader is 124mm high and 92mm wide (1:1.35). Coincidence? Perhaps. But might their dimensions relate to our hand size or comfortable handheld viewing range? 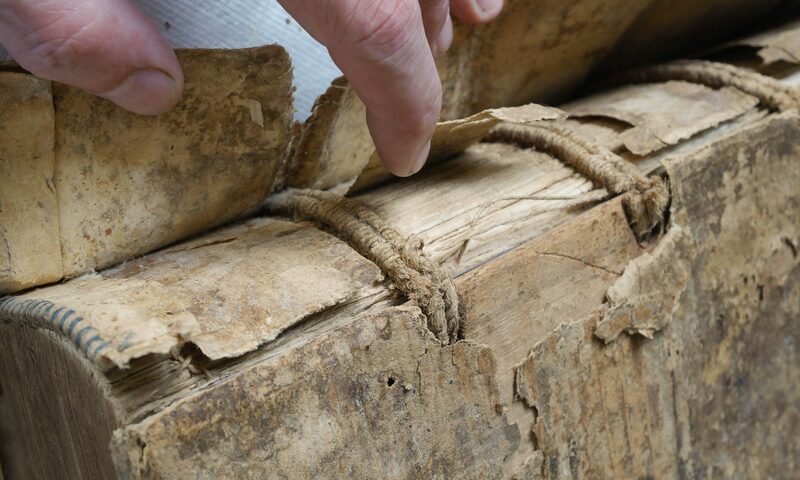 These books are separated by 13 centuries! I played with the Sony last weekend at the Small Press Fair in NYC. I was impressed by the resolution of the eink at any viewing angle, but page turns were agonizingly slow, and accompanied by an epeliptic inducing flash of background reversal– the text would go white, and the “page” black for a split second. I also tried out a prototype of the next version, which has a touch screen interface, but doubt this would be a great advantage when reading.There is a promotion on now at Sony— enter promo code: 10sonyclassic You can get 10 free ebooks to read on your computer or ebook reader from the “classics” collection– think 19th C. standard DWM’s. If you look at the first generation of paperbacks published by the company Pocket Books, back around 1939, you will find that they have a very similar size and proportion— probably about 4-1/4″ x 6-1/2″, if I remember correctly; as well as being sewn in signatures, on a paper that is bland but still sound after seventy years, with the grain of the paper vertical, and with a typeface that is bland but extremely legible and uncrowded. All modern American mass-market paperbacks are, in design, descended from these. It only took a year or so before wartime restrictions ruined their production quality, and you had perfect-bound newsprint; but those firstgeneration copies are a delight to read, and to bind. The squarer proportions lasted in American paprerbacks until around 1960, when all the publishers went to the taller format that Penguin had used all along (roughly 4-1/4″ x 7-1/4″)— and Penguin was always on newsprint, though the early ones were sewn in sigs. Hi Jeff, Thanks for the comments, and for the info about the graffiti symposium. Also its great to see someone reviewing these e-book reader things, I keep seeing them around but haven’t heard of anyone who’s actually tried one out. All the best, Dan. According to Robert Stevick (“The St Cuthbert Gospel Binding and Insular Design”, Artibus et Historiae 8/15 (1987): 9 – 19), the proportions of the Stonyhurst Gospel binding are 1:1.41, which would correspond to the measurements 134mm high by 95mm wide in the ranges you give. Put another way, this proportion is 1 to the square-root of 2, which is of course the proportion of the A and B series of papers used for letters, photocopying etc. in most of the world outside North America and Japan, and which has always looked to me a more elegant proportion than the rather squat Letter size, let alone the horrifically etiolated Legal/Foolscap size. How would 7th century Anglo-Saxons have arrived at this proportion in practice? Simple: just draw a square with sides of length corresponding to the short sides of the page shape you want, then draw a diagonal between opposite corners. That diagonal is the length of the longer side. Thanks for the info. Any speculation why this proportion might be so pleasing and durable? Sorry for the delay in replying Jeff. I’ve no idea why this proportion should be aesthetically pleasing, unless our eye is subconsciously able to sense that the length of the longer sides is related (as the diagonal) to a square made from the shorter sides. Just as we’re able to sense the aesthetic pleasure given by the interlocking spirals of a sunflower’s seeds before we know anything about the Fibonacci sequence, or the sense of balance in a painting or piece of music that employs the golden section. I wouldn’t say it’s unknowable why these things please us, but I’ve no idea how one would go about investigating the question — a project for a neurologist or a psychologist, perhaps. It’s not surprising to me that the educated medieval European mind would have come across and used the 1:1.41 proportion, though. The diagonal/square relationship makes it pretty obvious, I think, that it would have been discovered by someone with a knowledge of geometry (and probably rediscovered many times by many people over the centuries). Before Fibonacci introduced Indian/Arabic numerals and positional notation, of course, European mathematical thinking was hugely reliant on geometry, so mathematicians would have been accustomed to playing with, and thinking about, the combinations and relationships that were possible between all the basic geometrical shapes. Insular manuscripts, with their mixture of Anglo-Saxon and Celtic decoration, show a fascination with interlocking geometrical patterns (think of the carpet pages of the Lindisfarne Gospels, for instance), making it easy to see both how a geometrically derived proportion would have been discovered and the sort of mystical importance that might have been attached to it. I remember once talking to an art professor about this, and he told me that in an intro to drawing class he would have students draw a square, circle and rectangle freehand. Once the drawings were measured, he said it was always the rectangle that was closest to the ideal.